JUPITER, Fla. — The dusty glow projecting from behind the practice fields, at his back as he lugged a backpack and grocery bag from the parking lot early Thursday morning, his shadow stretching forever on the concrete walk, is a promise or a trick. That new sun, the new day, would be his to decipher. My 40-minute drive had begun in darkness and become purple-gray-blue, and it had gotten me to thinking about Dexter Fowler, which maybe was weird. “A little weird,” he confirmed. Well, hit a buck-eighty over 90 games, get shoved from center field to right, fall out of the leadoff spot, find yourself in a controversy over your relationship with the manager, grow dispirited, break your foot and sit out the final two months and there is nothing quite like another shot at the day, a day, any day. Sometimes you find misfortune, or despair, just as you might find opportunity, and sometimes it finds you. And sometimes it is both. “That’s life, right?” he said, and that’s what comes next. Fowler is healthy again after starting the offseason in a walking boot. Entering the third year of a five-year contract with the St. Louis Cardinals that still owes him $49.5 million, he will be 33 in a week. He told the St. Louis Post-Dispatch this winter he’d suffered from bouts of depression in his second year with the club, and in those moments had become angry with himself for being unable to shake it, and that is where the season went, into those lonely places that hide from the new sun. He is easy to like. He is a more than competent ballplayer, or was until whatever last season was, and certainly can be again. And he is important to what becomes of the Cardinals, who have a fight ahead in the NL Central. Now it’s a matter of stacking the days, good ones, until they, too, are routine again. This is him, keeping going. Different, maybe, from starting over. John Mozeliak, president of baseball operations for the Cardinals, stood Thursday morning behind a chain link fence, where he watched an intrasquad game consisting of tomorrow’s Cardinals, young men very serious and mostly anonymous. While scanning the sky for a foul ball, he noted that Fowler had healed from his foot injury, that Mike Shildt would be a different kind of manager than Mike Matheny was, and that Fowler had plenty of game left in him. It seems clear he appreciates Fowler, likes him, even admires him. I asked if he thought Fowler was a sensitive person. There is, of course, no perfect leader, no perfect manager. They all get fired eventually. There are, however, perfect leaders for some. Mike Shildt steers with a folksiness, an honesty, that is subtle and disarming. When a reporter asked Thursday who would manage the other half of an upcoming split-squad game, Shildt asked the reporter which game he’d be attending. “I think I’ll be staying here,” the reporter said. 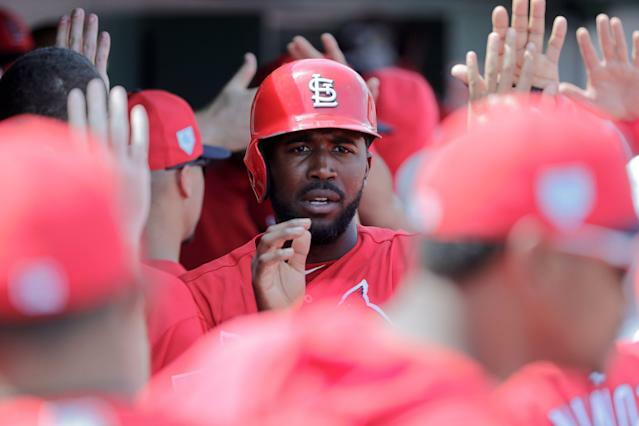 Perhaps it would be unfair to say Fowler – or any of the Cardinals, for that matter – would require a new boss, or that a different boss would have had any bearing on Fowler’s lost season. It is baseball, out there, no matter who is on the top step. The club did seem to respond well to Shildt, however, and Fowler might have as well, had his season not ended in early August. What a buck-eighty reminds you is it’s a hard game played by big, strong, fragile people. Feet break. Psyches bend. Center-cut fastballs get fouled back. Careers hang in the middle of it. A bad season ends. With any luck, a new one begins, on one of those new days we’ve been talking about. I asked him if, during the worst of it, he missed that guy. The joyful guy, I said. The one who can’t get enough of this. You.